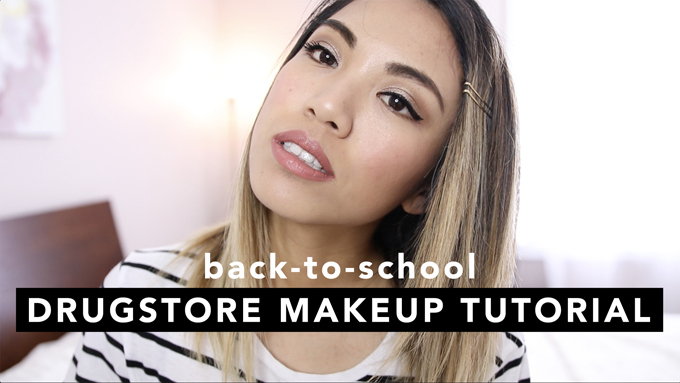 Back-to-School has officially begun for some, so I've created a makeup look to help you look your best (or at least awake) in school using drugstore makeup. Here's a look that I would wear to school (if I were still in school). I created a simple look that's easy to recreate even if you're in a rush in the morning. When I was in college, I mainly used drugstore products when it comes to doing my makeup. Being a college student, buying makeup can be a bit of a luxury. But with good drugstore makeup options these days, you can enhance your look without breaking the bank. There are days when makeup just helps me look alive in the presences of others, especially when I have been cramming my homework from the night before. I also tend to stick to neutral colors and just keep it simple. I would save my super done-up face for prom/gala/homecoming or other formal school events. I also have shared my current drugstore skincare favorite in the video. These items are the ones that I have been reaching out for lately and have helping with my acne. I've also had acne problems since college. It's not as bad as it used to be, but it still comes and goes and these products help keep it at bay when it wants to make an appearance. - NYX Cosmetics Mineral Stick Foundation in "Golden Beige"
- Rimmel Stay Matte Pressed Powder Foundation in "Silky Beige"
- Nuance Salma Hayek Endless Eye Effects Shadow Collection in "Neutral Expressions"
- Maybelline Color Tattoo Eye Chrome in "Beige Luster"
- Essence Make Me Brow Eyebrow Gel in "Browny Brows"
- Flower Beauty Zoom-In Ultimate Mascara in "Intense Black"
- Maybelline FaceStudio Master Contour & Highlight V-Shape Duo Stick in "Medium"
- Pixi Beauty Multi-Balm in "Watermelon Veil"
- Revlon Insta-Fix Highlighter Stick in "Gold Light"
- Revlon Ultra HD Matte Lipcolor in "HD Forever"
And if you stayed til the end of the video, you're probably here for some "Bacon Tomato Sandwich" ;) (get it? BTS? Back-to-School? haha). This is my way of saying thank you for the support that you've given me whether it's on my blog, YouTube, or other social media. I wouldn't be here without your love. There will be two winners (one from YouTube and one from Facebook). Please read the directions carefully if you want to enter the contest. You can enter both contests if you want. What each winner will win is pictured below (*I will update this post with the list of items on each set later*). - This is an international giveaway! - Winners will be announced via Twitter and Snapchat on Sunday, September 4, 2016. 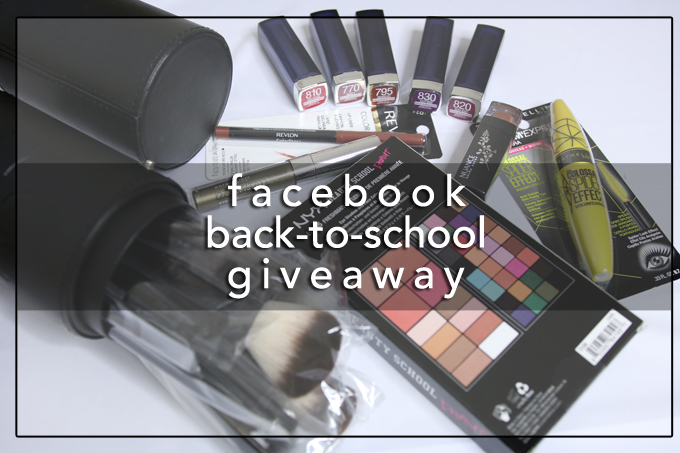 - Winners will be contacted via Twitter (for the YouTube giveaway) and Facebook message. Winners have 48 hours to respond to my message with their mailing address or another winner will be chosen. 3. Leave a comment (ON THE YOUTUBE VIDEO COMMENT SECTION) letting me know your current favorite/cant-live-without drugstore product(s) and why. Please leave your Twitter handle on your comment, so I can reach you if you end up being the winner! 4. 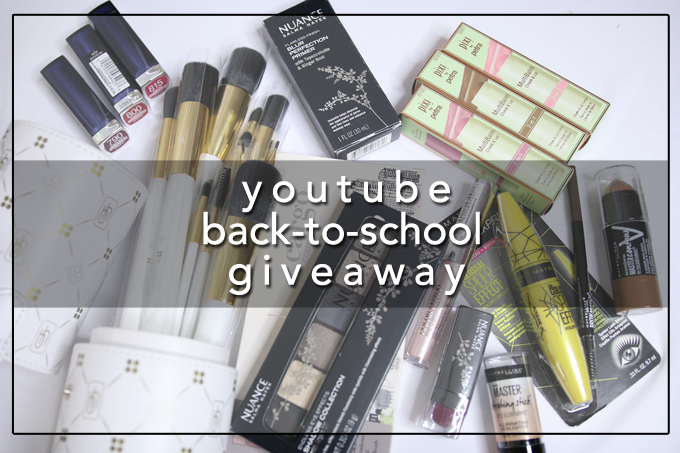 Extra points: Share this message on Twitter: "Back-To-School Makeup Tutorial using Drugstore brands via @yummiebitez - https://youtu.be/B9NiaGifYL4"
I absolutely love your website! You are a great inspiration and I love your YouTube videos.